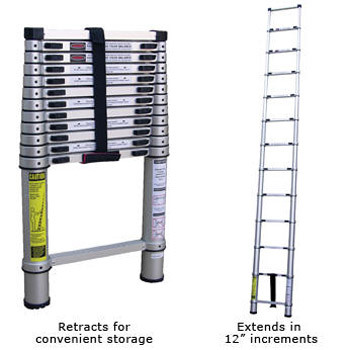 Aluminum Telescopic Ladders are ideal when storage space is limited.The lightweight and low profile design allows for storage in closets or tight spaces. Small enough to transport inside cars, trucks and vans to minimize theft. Each step is serrated and has a spring loaded locking pin that automatically engages to secure step height. The release mechanism provides a smooth automatic closing design. These ladders extend in 12" increments. Top bumper guards and molded rubber feet protect walls and floors against scratches. Conical feet for maximum slip resistance and extra wide base for stability. Meets OSHA and ANSI specifications. See chart below for specs. 18 1/2" x 2 3/4" x 29"
19 1/4" x 3 1/2" x 32"
6" - 12' 18" x 4" x 32"
6" - 15' 19" x 4" x 36"
WOW- This new telescopic ladder is the coolest thing since s ..